About 30-35 years back T R Shamanna, V S Krishna Iyer, T D Naganna, G Narayan, Ramdev, J Lingaiah....were the few names familiar to every Bangalorean. They were the city fathers, i.e., Councillors of the then civic body of Bangalore. Bangalore was not this big. The Councillors were taking up the cause of real civic issues and hence were very nearer and dearer to the people. TR Shamanna was popularly called as Cycle Shamanna. And there was an interesting story behind it. During those days, the most popular mode of transport for the common man was Bicycle. It was more utilitarian and considered as the common man's vehicle. It was common to see cycle stands, cycle shops..etc everywhere. Each cycle had to possess a license. ( yes, you may not believe it now). Once, the municipal body raised the cycle tax. This group led by Shamanna organized a popular movement and succeeded in getting the cycle tax and the licensing abolished. T R Shamanna became Cycle Shamanna. V S Krishna Iyer, was a well known name then for his generous service to the City. He was the Mayor of Bengaluru and became a big name for his benevolence. He was the Urban Development Minister too in the State Cabinet and later became Member of Parliament from Bangalore South in 1984. In fact he was lone opposition candidate from the state to win in those Parliament elections that were held immediately after the assassination of Mrs Indira Gandhi. Such was his popularity that he could swim against the tough wave of sympathy that was around then. I very well remember even now, that how he helped our team in Delhi when we had been to Amarnath Yathra during 1985. After I became the minister, he regularly called me to congratulate whenever some good deed happened in our department or some news appeared about me. Such a large mind he has. 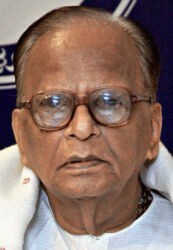 Today, Krishna Iyer is seriously ill, getting treated at Appollo hospital. He is 90 years now. When I sat besides him today, in the hospital, I could see a flash of recognition in his eyes. So energetic person he was during his hey days.. This senior citizen has been our city's proud possession and will remain so. I pray for his health and speedy recovery. Later I was at Nephron-urology unit located in the premises of Victoria hospital. Sri Patil Puttappa, the grand old man of our state is admitted there undergoing treatment for his prostrate gland surgery. The freedom fighter, noted editor-journalist, a fighter for the cause of Kannada and Karnataka..... Sri Patil puttappa, is popularly called as Papu by everyone. Papu is 95 years young! When I sat with him, it wasn’t surprising that he never uttered a single sentence about his ailment. He relentlessly spoke about the need to save our language. He was explaining about his dream project of Gandhi Gram near Hubli. In fact he invited me to come for foundation stone laying ceremony in September. Throughout my time with him today, I couldn’t notice a tinge of agony on the face of this just operated nonagenarian. V S Krishna Iyer and Patil Puttapa, both are the conscious keepers of our land. They have guided, appreciated and at the same time have not hesitated to correct and stop any wrong step or the misdeed that the present people do. The guidance of such personalities is all the more required in these days of everyday turmoil. I pray that all may go well with them and that they may be in good health for years to come! Namaskara sir, your post in the blog is enough to get inspired. We also pray god for their good health. but tell me sureshji, when are you taking back a G category site given to some individual in Mysore, on some personal relationships? Dont you think any conscious person coulde done this act against public spirit? indeed they are truly inspiring. Hope media gives time to spreading messages from such selfless souls than focusing merely on sensationilizing some silly fights involving politicians. Great sir.U realy need this to communicate with younger gen.
Glad you are back in the ministry, we were tensed that you may get sidelined due to the mindless groupism. Please spend a few minutes every day to post something to bangaloreans & the state youth in general & also steps taken by your govt. towards a better tomoro.